Cinecultist was pretty psyched to see Zhang Yimou's The House of Flying Daggers. From people who'd seen it during this year's New York Film Festival, we'd heard it was better than Hero, a movie we enjoyed quite a bit. Also, it seemed to bode well that the distributor, Sony Pictures, seemed more anxious to get Flying Daggers into American theaters than Miramax did with Hero (2 years is a long time to sit on a movie people, we will continue to hold a grudge on that one). 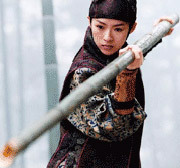 However, Flying Daggers had an even patchier plot, and while the visuals are quite lovely (Zhang Yimou makes moving paintings, not moving pictures) it wasn't enough for CC. Leaving the theater we marveled over the awesomeness of Takeshi Kineshiro (feel free to whisper in our ear any day), but why the obsession with being the wind? Isn't that just another way of saying you're a commitment phobe? It all seemed too juvenile to CC. The kind of story written by a spurned junior high school boy convinced that the cute girls always choose the bad boy over the one who's really dedicated to her, ie. him. It seemed like too much special pleading to us, and not emotionally resonant as it was trying to be.